In this interdisciplinary study, Clare Eby argues that the writings of Theodore Dreiser and Thorstein Veblen form a neglected chapter in the history of United States cultural criticism that is especially relevant today. This study leaves behind the narrow frameworks through which most of Veblen's and Drelser's writings have been interpreted, covering a wide range of both authors' major and minor works. 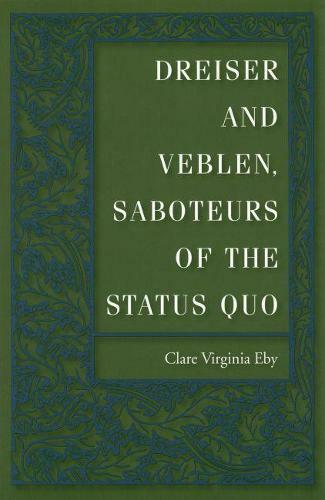 Moving beyond Veblen's The Theory of the Leisure Class and Dreiser's Sister Carrie, Eby shows how the two writers, as saboteurs of the status quo, anticipated many preoccupations of cultural critics today: the cultural role of the intellectual, the relationship of science to society, the place of consumption in modern life, and the intersection of class, gender, and power.